Recently we put our our first balance patch for Project Exonaut. Here is an overview of the process, data and how I reached the decisions of what to change. The data held true to my expectations but there were certainly some surprises in there too. 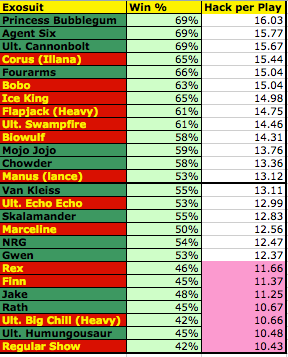 Here are the Exosuits sorted by hacks/per play session. You can see the top Exosuits are high-level Atlas exosuits. I mostly attribute this to dedicated high-level Atlas players. I knew the Bulldog pistol exosuits would be high. In designing the exosuits initially, I thought Bulldog mod exosuits would underpowered due to having a period of time before they could access their most powerful weapon. As a result I made their stats a bit higher than standard exosuits. This was a mistake and I knew it almost immediately after the game launched. Bobo was nerfed long before this path but he still remains a high performing exosuit. I was right about Jake and Rath. They were 2 of the lowest performing exosuits. I really didn't like that the exosuits for our best shows (Adventure Time & regular Show) were some of the lowest performing exosuits. I knew I needed to buff them up. Basically any exosuit that had less than 12 hack per play got buffed. The average hack per play across all Banzai exosuits was 13.21. The average across all Atlas exosuits was 15.01. The Base exosuits performed lower, as expected due to guest players, but they were nice and even. Surprisingly, the medium Banzai exosuit was the best performing, albiet by a small margin. My prediction of the Phantom was incorrect, though it came in second. This number was a bit difficult to calculate. I took the hacks for exosuits by their weapon mod and used that to calculate the total number of hacks per capita of a weapon. Certainly not 100% accurate but it's the best I could get with the data. The weapons seems nicely balanced. The Marksman rifle being the lowest was expected as it is more of a high-skill weapon. 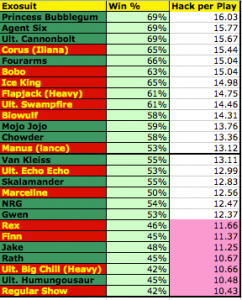 It's effectiveness in the right hands is displayed by the win percentage of Marksman mod exosuits like Princess Bubblebum and Ultimate Swampfire though. You can read about all the changes made in my previous posts.